A football-loving five-year-old with terminal cancer has developed a new tumour, his family have said. 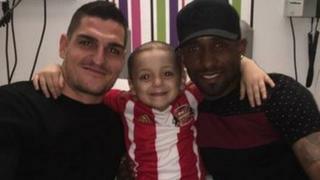 Sunderland fan Bradley Lowery, who was diagnosed with neuroblastoma in 2013, recently underwent further treatment in an effort to prolong his life. However, in a Facebook post, the County Durham family said scans showed a tumour had developed at the base of the youngster's back. They described themselves as "devastated and heart-broken". Although they will not receive official results until next week, Bradley's family, from Blackhall Colliery, near Hartlepool, said they wanted to let his supporters know about the development. The post, written by Bradley's mother Gemma, said: "Bradley scans show that there has been a small reduction in some parts, however there is a new tumour on the bottom of his back. "As you can imagine we are devastated and heart-broken with this news as I really wanted the new treatment to work. "We are not sure where we go from here as it will depend on his bone marrow biopsy results. He is getting this done tomorrow, but results won't be back for another week. "Why is life so cruel? Why do we have to get bad news time after time? Why does my baby not get a break?" Well-wishers raised hundreds of thousands of pounds last year to pay for Bradley to be given antibody treatment in New York, but medics then found his cancer had grown and the family were informed his illness was terminal. He has since undergone "tumour-shrinking treatment" at Newcastle's Royal Victoria Infirmary. People took Bradley to their hearts following an appeal which saw him receive 250,000 Christmas cards from across the globe. His love of football then resulted in him winning the Match of the Day Goal of the Month award in January after he took to the pitch to take a penalty ahead of Sunderland's game against Chelsea. He has also appeared as a mascot for Everton, who last year pledged £200,000 to his fundraising campaign, and was recently visited in hospital by a number of Sunderland players.